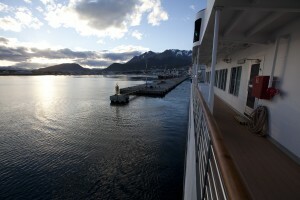 This evening, M/V (motor vessel) Silver Explorer will sail from Ushuaia, out the Beagle channel for approximately 80 miles and then head south for the Drake Passage. The Beagle channel was named after the ship HMS Beagle during its first hydrographic survey of the coasts of the southern part of South America, which lasted from 1826 to 1830. The Beagle, on its second survey, carried Charles Darwin on some of his most famous expeditions. After boarding, we explored the ship – checking out the observation lounge, the theater and the whirlpools, before returning to our room. Later in the evening, both our personal butler, and our suite attendant, both from the Philippines, stopped by to introduce themselves. We also have a “pillow butler”, and I opted to have 2 of the pillows changed to ones that are a little more firm. With any luck, they will help us to sleep better tonight. 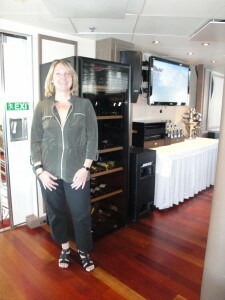 Bonnie is shown at left with her new best friend, a large Eurocave wine fridge! This is the big brother to the one that Mark bought me in Ireland and is still fridgeing away in San Francisco. The departure time has been delayed by about 3 hours, because a passenger has missed the flight from Buenos Aires. So, this afternoon’s itinerary has been pushed back a little. None the less, we assemble at 5:15 in the theater for a mandatory safety and life boat briefing. It is suggested that we bring our parkas and we must bring our life vests. As a result, the theater is a sea of red (parkas) and orange (life vests). 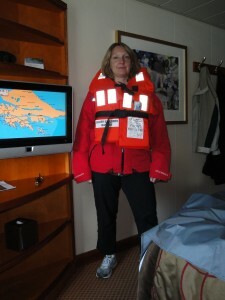 Bonnie is shown here modeling the latest in “abandon ship” fashions. Upon returning to our room, there is a bottle of champagne chilling on our table. What a lovely welcome aboard! Then, at 6:45, we are back in the theater for staff introductions. The expedition team is amazing – a group comprised of experts in birds, marine biology, history, photography, as well as general naturalists. These are the individuals that will accompany us on our Zodiac landings. We are also given a briefing on the weather, which is not looking good – swells of 6 to 8 meters (18 to 24 feet) are expected in crossing the Drake Passage, which could take up to 36 hours. We are instructed to be prepared for “movement” in our cabins, by making everything secure – meaning put anything that isn’t tied down on the floor, so it doesn’t roll off. We are also assured that, in the next day and a half, no matter how many times we ask ourselves “What in the hell were we thinking when we paid a ton of money for this trip” it will all be worth it, and all other trips, both before and after Antarctica, will pale in comparison. None of this is what I wanted to hear!! After the briefing, we walked out on the aft deck (that’s the back of the ship, for all of our non-nautical family/friends), where the tables and chairs have been roped together and tied down. Also, the whirlpools have been drained for the passage. We went to dinner around 8:00, and straight away, noticed that everything is chained to the floor in the dining room , the chairs the soup tureen, coffee urns etc.– probably not the best indication of things to come. Around 8:30, Robin announced that we were casting off, and were ready to set sail – our final passenger was on board! About half way through the meal, we were joined by another couple from New York / New Jersey. They are both attorneys – he works in mergers and acquisitions, and she is a prosecutor. They were very interesting to talk to. After a lovely meal, we “retired” for the evening around 9:30, and loaded up on the Dramamine. As we were leaving the restaurant, with two wine glasses with a couple sips each of Pinot Noir, one of the staff stopped us to take the glasses. Because of the expected weather, he requests that we not take these stemmed glasses with us to the suite (they are more top heavy and not as slip proof as the balloon style wine glasses, which we have in our room). Instead, he offers to send us an entire bottle of the Pinot Noir for our enjoyment this evening. As we were preparing for bed, we found Monday Night Football on the TV (nothing like MNF to make you realize how small the world is!!). Despite sports on TV, it has been a long day; we are exhausted and collapsed in bed.